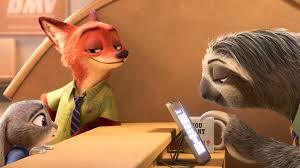 I’m not sure there’s a lot more to say about the new animated film Zootopia that hasn’t been said already. It opened to a very favorable critical response (99 % on rottentomatoes.com) and a nothing to be sneezed at box office. And I can’t argue with much that has already been said. Zootopia is, indeed, a clever, smart, feel good in a good way film and a fun time in the theater (with the best jokes centering around sloths, lemmings and how soft a sheep’s hair feels). Bored you will not be. The only thing I can’t say is that it’s very cute. 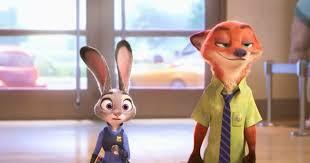 Only the central character, a rabbit, can say that, and you’ll only know why if you go see the film. The basic story posits a world where carnivores are no longer, well, carnivorous, which enables them to live side by side in peace and brotherhood in an attempt at a kind of utopian society that centers around the capital city, Zootopia, which looks like a mixture of the Emerald City and Panem. Of course, it’s not perfect. Though the citizens more or less intermingle, the city still finds itself divided into various neighborhoods, each with their own eco-system and way of life. 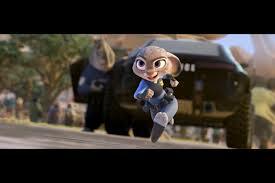 And our intrepid central character, Judy Hopps (she’s a bunny, of course), is about to feel the full force of what is wrong with Zootopia’s society as she tries to become the city’s first rabbit cop, something her kind have never really aspired to before because they are so small, have trouble passing the physicals and are just, well…so cute you want to hung them and squeeze them and…sorry, wrong cartoon. Judy immediately faces discrimination on her very first day of duty when she’s made Meter Maid rather than given a beat or assignment. However, she gets a chance to prove herself by trying to solve a case of missing persons; several citizens have simply disappeared, and no one on the force is making any headway to finding them. Judy then corrals Nick Wilde, a foxy fox, the most distrusted of all the species, into helping her and by so doing, sees that formula is saved and even celebrated by becoming a cop buddy movie (and by so doing, makes it pretty clear early on who the ultimate bad guy is). As I said Zootopia, directed by three people and written by eight, is fun and clever, but you probably shouldn’t think about it too hard. I don’t remember the movie ever explaining just how the carnivores now survive since they don’t eat meat. And in end, this carnivorous problem is solved by assimilation, rather than allowing them to be who they really area. And I’d hate to have a pool as to who the public thinks the carnivores are a stand in for in present day society, especially in the year of the Trump. We might get an ugly truth. All that is really clear is that foxes are a stand in for France, since everybody hates them. But still, it’s a very imaginative, if not…cute, social parable. With Ginnifer Goodwin, who is the perky never say die voice of Judy; Jason Bateman, whose snarky line deliveries are a perfect fit for Nick; and a ton of other familiar voices you won’t be able to identify until the credits roll. I agree! I thought it was a good story and an original story but I felt bored during most of it. It is cute but it is one of the few kids films that didn’t tug on my emotions. My son even cried at the end of Good Dinosaur. Overall it was well developed. Can’t believe there were that many writers yikes. I wasn’t bored exactly, but I wasn’t as caught up in it as others were. I think your analysis is right.